Bhikkhuni Ru Yi was born in Fufeng County, Shaanxi Province, China. In 1982 she graduated from high school, and tonsured in Zhongnanshan, and was named Ru Yi and entitled Chao Yin (Beyond Causes). In the same month, she went to study Dharma with Bhikkhuni Master Long Lian in Chengdu in Sichuan Province. In 1984 she entered Sichuan Buddhist College. In March 1987, she received full bipartite ordination from Sichuan Buddhist College and Wenshu Yuan Monastery. In the same year, she went to study in the USA at University of the West in Los Angeles, California for one year. 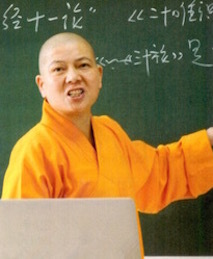 Since 2006, Venerable Bhikkhuni Ru Yi has attended the World Buddhist Forum three times. In 2015 she was honored with the post of Abbess of Qifu Temple in Sichuan Buddhist College. Currently, she serves as the Managing Director of the China Buddhist Association, Vice-Chairperson of the Sichuan Buddhist Association, Representative of Sichuan Province in the National People’s Congress, and President of Sichuan Buddhist College. She has ordained more than 3,000 Bhikkhunis to date in the provinces of Sichuan, Guizhou, Shaanxi, Yunnan, Hunan and Shanxi in China. In addition, she relocated and renovated her College Campus, a ten year process! In June 2016, Bhikkhuni Ru Yi joined the Chinese Buddhist delegation to visit Japan. In addition to her international contributions, she lead disaster relief efforts for the 2008 earthquake in Sichuan Province and also organized a Buddhist Calligraphy Exhibition to inspire love and charity for impoverished children in Sichuan Province. For this effort, her college received the “2015 Special Contribution Prize for Social Charities,” by the Charity Organizational Committee of the United Nation’s Millennium Development Goals.